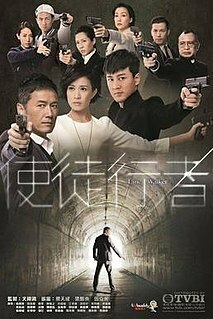 Glittering Days is a TVB period drama series broadcast in November 2006. The series is shown to celebrate TVB's 39th Anniversary. Liu Kai-chi is a Hong Kong actor, best known for his "everyman" supporting roles. For 25 years he worked for TVB, Hong Kong's first over-the-air commercial station, but did not renew his contract in 2005. Following the success of Healing Hands I and II, Hong Kong's No.1 Television Channel, TVB, introduced Healing Hands III. Bowie Lam is an Hong Kong actor with the TVB network. He has starred in several popular dramas including File of Justice and Healing Hands. Queenie Chu or Queenie Chu Wai Man, born in Hong Kong, on April 22, 1981 with family roots in Shunde, Guangdong, China, is a Hong Kong television presenter and actress affiliated with TVB. She was also Miss Hong Kong 2004 1st runner-up. Benny Chan, also known as Chan Ho-man (陳浩民), is a Hong Kong actor and singer. Wong Cho-lam is a Hong Kong artist currently working for TVB. He works as a stage actor, stage director, television actor, voice actor, DJ, television host, lyricist, scriptwriter and singer. He graduated from The Hong Kong Academy For Performing Arts in 2003 with First Honors in Bachelor of Arts majoring in acting. He is a member of the Composers and Authors Society of Hong Kong Limited. Chor Lau-heung is a Hong Kong wuxia television series adapted from the first three novels in the Chu Liuxiang novel series by Taiwanese writer Gu Long. Adam Cheng starred as the titular protagonist, Chor Lau-heung. The series was first broadcast on TVB on September 3, 1979. The 65 episodes long series was divided into four parts: The Legend of Mo-fa (無花傳奇), The Great Desert (大沙漠), Legend of the Divine Palace (神宮傳奇) and The Final Battle (最後一戰). 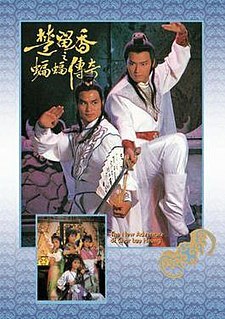 The New Adventures of Chor Lau-heung is a Hong Kong television series adapted from Chu Liuxiang Xinzhuan of Gu Long's Chu Liuxiang novel series. Michael Miu Kiu-wai starred as the titular protagonist, Chor Lau-heung. The series was first broadcast on TVB from 12 November 1984 to 4 January 1985. It was rerun in Hong Kong on TVB Jade from 1 February to 30 March in 2006. Romantic Repertoire is a 2015 Hong Kong romantic comedy television drama created and produced by TVB, starring Moses Chan and Joyce Koi as the main leads, with Louise Lee, Evergreen Mak, Katy Kung, and Jason Chan in main supporting roles. Filming took place from June till September 2014. The drama aired on Hong Kong's Jade and HD Jade channels March 30 till April 24, 2015 every Monday through Friday during its 8:30-9:30 pm timeslot with a total of 20 episodes. TVMost is a Hong Kong online video platform established by Most Kwai Chung, the company which also runs Hong Kong magazine 100Most. It aims to upload numbers of sarcastic videos for Hong Kong citizens in a daily matter, so the public can realize the latest events happening in Hong Kong in an entertaining way. Its slogan is "Do our best instead of not having a TV license issued by the Government". Sina Weibo (新浪微博) is a Chinese microblogging (weibo) website. Launched by Sina Corporation on 14 August 2009, it is one of the most popular social media platforms in China. As of Q3 2018, Sina Weibo has over 445 million monthly active users, with surging stocks, advertising sales, revenue and total earnings in the quarter. At the start of 2018, it surpassed US$30 billion market valuation mark for the first time.